You must file your tax return with the Inland Revenue AND make payment by midnight Wednesday 31st of January 2008 to avoid penalty charges. 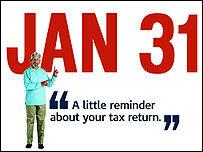 Failure to file your self assessment tax return by midnight 31st January 08 will result in an automatic £100 fine. Ensure that you have all the necessary forms that need to be completed. If not then visit your local tax office to get them. If you are completing by hardcopy, then hand deliver the report to your local tax office rather than rely on the post. To complete the form online you must already be registered for online self assessment, if you are not already registered then it is now too late to file your tax return on line as it can take 1 to 2 weeks to obtain your password for online access to the Inland Revenue portal. If you are registered to file your return online then try not to leave it until the last day, when demand for the Inland Revenue website will be high, with some 9 million returns expected and approximately half filed online. Also note - NOT ALL forms can be completed online, so double check now rather than leaving until the last minute. A summary of the key Tax Dates for the Tax Year ending 2006-07. What Happens / Why Is This Date Important? 6 April 2007 This is when the 2007-08 tax year starts. A 2006-07 Tax Return or Notice to Complete a Tax Return (SA316) is sent out to all people who get a tax return each year. 31 July 2007 Second automatic penalty of £100 charged if your 2005-06 Tax Return was due back by 31 January 2007 but it has not been received. Collect tax through your tax code, if possible, where you owe less than £2000. collect tax through your tax code, if possible, where you owe less than £2000 in the 2008-09 Tax year. 1 February 2008 If you were sent a Tax Return by 31 October 2007 you will be charged a penalty of £100 if the Inland Revenue has not received your return by this date. 28 Feb 2008 Automatic 5% surcharge if you have not paid in full tax due for 2006/07 by this date. 6 April 2008 The new tax year starts. A Tax Return or Notice to Complete a Tax Return (SA316) will be sent out to all people who meet the criteria to get a Tax Return each year. So in total you now have some 10 months to complete your self assessment returns. Make a plan of what you are going to do and when, i.e. you could start this month by making sure you have all of your receipts and paperwork at hand, place it on a box file labled 2006-07. Next use an Excel spreadsheet to list all of your income and expenditure. Don't leave it until the 31st of Jan 08, only to find out that the civil servants have gone on strike again ! To help you calculate your tax, use our online tax calculator (update due late April 07), and in answering your queries at the http://www.moneyforums.co.uk website.